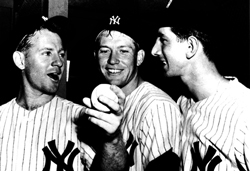 Mickey Mantle's life story told by The Mick himself - "the most entertaining sports profile ever!" To watch selected video clips from the DVD Click Here! "The best baseball program ever made!" This is the program Mickey Mantle fans have wanted for years. This DVD is Mickey's life story, told by The Mick himself. More than a biography, it's Mickey's autobiography. The Deluxe Lost Stories Edition DVD features the complete two-hour edition of Mickey telling his favorite stories plus nearly 200 pages of DVD-only on-screen Special Features! For the first time, the two hour-long segments – Mickey's complete story – are combined in one spectacular Deluxe Edition DVD, loaded with extras only available on DVD. It includes the original award-winning #1 best-selling documentary, Mickey Mantle: The American Dream Comes to Life® plus the award-winning bonus hour, The Lost Stories. Hailed by critics and fans alike as "one of the most captivating and compelling sports programs ever," this Deluxe Edition contains over 20 all-new stories chosen for release by The Mick himself. It also includes a comprehensive DVD-only extra - "A Fan's Guide to Mickey Mantle" - loaded with facts, stats, quotes by or about Mickey, a Mickey Mantle quiz, FAQs (Frequently Asked Questions), the story behind Mickey's 10 longest home runs, and much more information about The Mick. 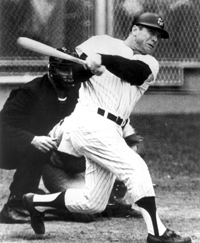 Casey Stengel & his "Stengelisms,"
plus many other Mickey Mantle stories including stories about Yogi Berra, Joe DiMaggio, Ted Williams and others, "The Denny McLain Gift Home Run," "The Copacabana Birthday Brawl," "Casey Stengel & the Senate Kefauver Committee," "Don Larsen's Perfect Game," and even the hilarious "Billy Martin Cow Story!" All this plus the most comprehensive compilation of Mantle game footage ever assembled! Scored with original artist music by Roy Orbison, Chuck Berry, Hank Williams, The Coasters and Chubby Checker. Check it out! Watch some clips of Mickey telling selected stories from the Deluxe Lost Stories Edition DVD of his award-winning Videography™ Program. CLICK HERE! NOTE: For a complete content outline of the two- hour Deluxe Lost Stories Edition DVD, CLICK HERE. Selected by Mickey, these new stories complement and complete the original program. To top it all off, there's Mickey's appearance in Paul Simon's "Me and Julio" music video! Scored with original artist music by Johnny Rivers and Paul Simon. Not sold separately, this bonus program of never-before-seen footage, a full hour, is available only in this Special Edition DVD. Get the complete 2-hour edition of Mickey's award-winning Videography™ (video autobiography) Program. A must for all fans, it makes a perfect gift for birthdays, Christmas, Father's Day and other special occasions. 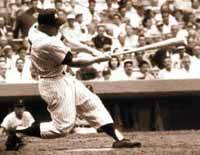 "A Fan's Guide to Mickey Mantle"
1. Mini-Biography: A short biography about Mickey's life. 2. FAQs (Frequently Asked Questions): Answers to thirty questions fans frequently ask about Mickey. 3. Mickey Quotes: Over 150 quotes by and about Mickey. 4. 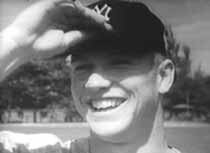 Mickey Mantle Quiz: Over 100 quiz questions to test your knowledge about Mickey. 5. 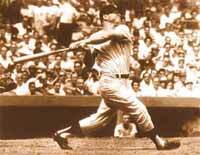 Home Run List: Every one of Mickey's regular season, World Series and All-Star Game home runs. 6. 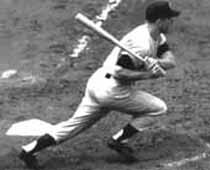 Mickey Mantle's 10 Longest Home Runs: The story behind Mickey's 10 longest home runs, with photos and diagrams of each one of these mammoth blasts. 7. Lifetime Statistics: Mickey's complete lifetime stats. 8. World Series Statistics: Mickey's complete World Series stats. 9. Topps® Baseball Card Gallery: Mickey's regular issue Topps® baseball cards from 1952-1969, with a description and history of each one. There's never been such a complete, all-inclusive package of Mickey Mantle material. 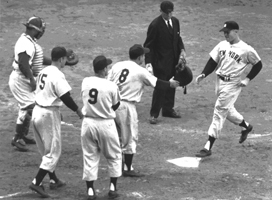 Designed and produced especially for Mickey Mantle fans, The Deluxe Lost Stories Edition DVD is a must for everyone who loves baseball, the NY Yankees or Mickey Mantle. Get the complete 2-hour edition of Mickey's award-winning Videography™ (video autobiography) Program plus the spectacular 192-page on-screen bonus section - "A Fan's Guide to Mickey Mantle" - only available on DVD. It's the perfect gift for Christmas, Father's Day, birthdays, anniversaries or any occasion you want to make special. CLICK HERE to ORDER NOW from our * Store! CLICK HERE to watch selected video clips of The Mick telling his life story from the best-selling Deluxe Lost Stories Edition DVD of his award-winning Videography™ (video autobiography) Program! Save $10 off the suggested retail price - Only $29.95! CLICK HERE for complete ORDERING INSTRUCTIONS! Internet - CLICK HERE to go to our * Store to place your order using your Visa, MasterCard or American Express Card, or PayPal. Phone - Call toll-free 1-800-THE MICK (1-800-843-6425) using your Visa, MasterCard, American Express Card or PayPal. FAX by faxing your order to us at (415) 346-0594 using your Visa, MasterCard or American Express Card (include credit card number, expiration date and your authorized signature, plus your name, address & phone number, and - for Visa and MasterCard only - the 3-digit card verification number located in the signature panel on the back of your card) or PayPal. Now you can upgrade from any previous edition of our programs (Standard Edition 1 hour video, Lost Stories Special Edition video or Standard Edition 1 hour DVD) to the new Deluxe Lost Stories Edition DVD - the full two hours plus "A Fan's Guide to Mickey Mantle" - (or upgrade to the 2-hour Lost Stories Deluxe Edition Video for those who prefer VHS video) for only $19.95, a special price only for customers who purchased the previous editions of our Mantle programs. BLV customers (web, phone & mail) who purchased their video directly from us can call us at 1-800 THE MICK (1-800-843-6425) and place their order by phone. Just tell us you want to upgrade and we'll look you up in our computer files. It's that easy! If you purchased the original program from a vendor other than BLV, just send us proof of purchase from the original video cover – the end flap – and you'll receive the special upgrade price of only $19.95 (plus $5.95 shipping and handling). If you need your copy quickly for a special event call us and we'll do our best to help you meet your deadline. 1. Proof of Purchase: If you bought your Standard Edition video directly from us you can purchase your upgrade right over the phone. Just call 1-800-THE MICK (1-800-843-6425) and we'll look you up your record in our computer. If you are listed you qualify. Or, if you bought your video somewhere else, just mail us the end flap from your original video cover as proof of purchase. 2. Payment: You can use your Visa, MasterCard or American Express Card right over the phone or mail us a check, money order for $19.95 (plus $5.95 shipping & handling – Calif. residents add $1.70 sales tax) payable to "BLV" or include your Visa, MasterCard or American Express Card information (credit card number, expiration date and your authorized signature plus - for Visa and MasterCard only - the 3-digit card verification number located in the signature panel on the back of the card) or via PayPal. 3. Shipping Information: Your name, address and telephone number. Mail your order to: BLV, 1253 Vallejo Street, San Francisco, CA 94109-2120. CLICK HERE to order online from our * Store. As soon as we receive your order we'll rush you your complete two-hour The Deluxe Lost Stories Edition DVD. The Mick's legacy of stories now has twice as much material! Order your copy today! Questions? Call us at 1-800-THE MICK (1-800-843-6425). Questions? Problems? If you have any questions, problems or special needs call us at 1-800-THE MICK (1-800-843-6425) or Click Here to send us an e-mail. We always try to accommodate our customers' needs! *The Estate of Mickey Mantle is in no manner associated with Yahoo! or Y! Shopping. Yahoo! 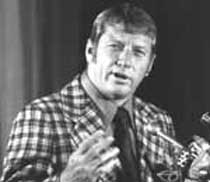 and its services are not affiliated with or endorsed by the Estate of Mickey Mantle.